Bigfoot Evidence: Whoa! This Trailer for "Stomping Ground" Is About Bigfooters and It's Awesome! Whoa! This Trailer for "Stomping Ground" Is About Bigfooters and It's Awesome! A feature film about love & Bigfoot hunting by DAN RIESSER. Written by DAN RIESSER & ANDREW GENSER. Produced by BRAD LAVERY & MIKE DE TRANA. Starring JOHN BOBEK, TARAH DESPAIN, JERAMY BLACKFORD, JUSTIN GIDDINGS & THERESA TILLY. Ben & Annie are a young couple on a weekend trip in the American south who, after meeting a charming old friend, embark on an impromptu "Bigfoot hunt" that threatens both their relationship and their lives. Ben & Annie are a couple living in Chicago on a weekend trip to Annie's small North Carolina hometown. At the local bar they run into Paul, an old friend of Annie's, and Ben learns something he never knew about his girlfriend: She believes in Bigfoot. In fact, she and her friends used to "hunt" for the creature when they were kids. Before Ben knows it, he's off on an impromptu Squatchin' trip deep in the Carolina backwoods. Amidst the Squatch calls, campfire stories and beers, Ben quickly realizes that Paul may have an ulterior motive in bringing Annie to the woods. And something else out here seems to be after her as well. Everyone but Ben thinks its Bigfoot. But it can't be, can it? After all, Bigfoot isn't real... 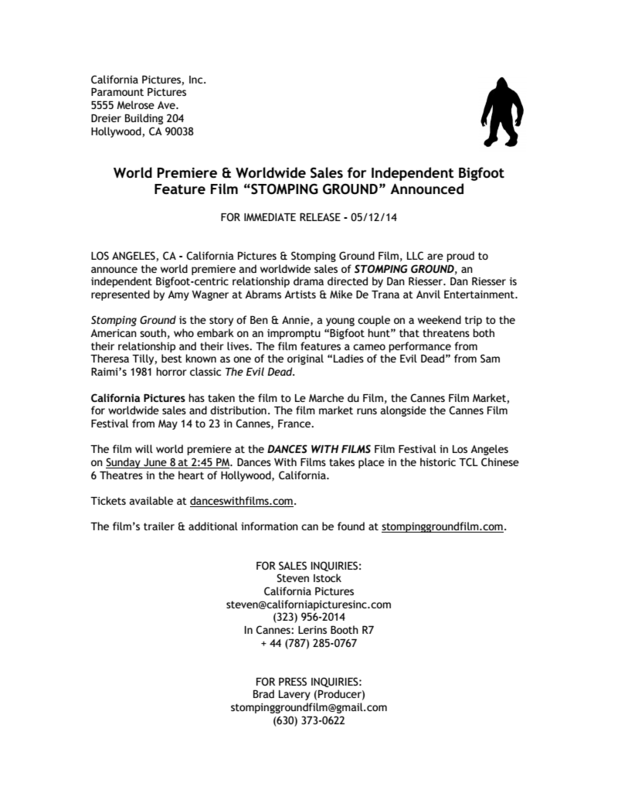 Stomping Ground is a micro budget comedic drama / horror hybrid feature film by first time feature director Dan Riesser. Only men in woods looking for serious 'evidence' will suffice for bigfooters. If you wanted to show them in a realistic light, you should have had 90 minutes of fat losers throwing blog bombs at each other. I don't know if some of them even own a sleeping bag let alone get into the woods. I'm not sure who should be more offended? City slickers, rednecks or Bigfoot. Another slasher bigfoot flick YAWN, SHAWN.